Many people love to drink coffee. Every day several pots of coffee are brewed in just about every home and business.These used coffee grinds can add up quickly and it seems like such waste to just dump them in the trash. It turns out that there are actually many reasons why we should not dump them out. 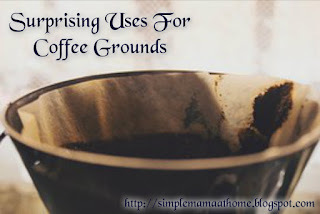 The following are some ways to reuse those old coffee grounds. 1. Make scented soap. Coffee is a great deodorizer and if you enjoy the scent of coffee then why not try making your own coffee soap. 2. Make a body scrub to exfoliate your skin. Mix some grounds with a little warm water or a little natural oil. Coconut Oil is a really good one to try. Then scrub your skin to help remove any dead skin cells. 3. Remove dark circles from under your eyes. Simply apply damp coffee grounds under your eyes and leave on for about 15 minutes. 4. Get rid of odors on your hands after chopping garlic or onions. Once you have finished rub coffee grounds over your hands. 5. Remove build-up from your hair. Before you shampoo your hair take a handful of dry coffee grounds and massage them into your hair. 6. Unblock a clogged sink. Pour some grounds into the drain followed by a small amount of dish liquid and a few cups of boiling water. 7. Remove odors especially in the fridge or kitchen. Simply dry out some grounds then place in a container and leave it wherever you have odors. 8. Remove scratches from wood furniture. Using equal parts of vinegar and warm water mix in enough grounds to form a paste. Rub the paste onto scratches using a soft dry cloth. 9. Clean stuck on dirt or stains from dishes or kitchen counter tops. Add some grounds and soapy water to a bucket then wipe over the area using a cloth. 10. Clean your grill. Since coffee has a grainy texture it works really well to remove stuck on foods and grease. 11. Clean the fireplace. Prior to removing the cooled ashes from the fireplace sprinkle some damp coffee grounds over the ashes. Leave for about 15 minutes and then remove the coffee grounds and ashes as you normally would. 12. Extend the life of your flowers. Mix in some coffee grounds with the soil in the vase. 13. Make scented candles. Get the tutorial here. 14. Use as a natural dye. Soak used grounds in hot water and use as a bath for dying fabric, eggs, or paper. 15. Add it to a compost pile. Coffee grounds are rich in nitrogen so they create excellent "green matter". 16. Non-toxic pest removal. Deter slugs, snails, ants, and other pests from your garden. Just sprinkle the used grounds in the areas you want to rid them from. 17. Keep the worms you are using for bait alive. Mix in some grounds to a cup of soil and then place the worms inside. The nutrients in the coffee will extend their life longer. 18. Boost your carrot or radish harvest. Mix fresh grounds with the seeds. This makes it easier to sow and will also deter pests. 19. Help keep cats away from your garden. Mix grounds with some orange peels and sprinkle the areas you have seen cats using as a restroom. 20. Help get rid of fleas naturally. After shampooing and before rinsing rub some grounds into your dogs fur.